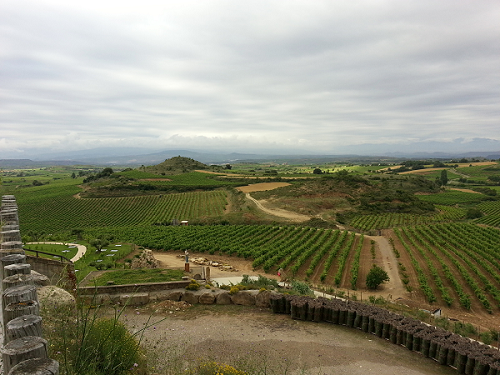 In July 2014, we traveled to the beautiful Rioja wine area located in the heart of northwest Spain. The Rioja area, which is responsible for approximately 40% of Spain's wine production, has a terroir that varies from the warm Rioja Alta region in the west to the slightly cooler Alavesa in the northeast, to the drier Rioja Baja to the southeast. We found a lovely small hotel located among the vineyards (see photo below) just outside of Laguardia, a walled village from the 13th century. 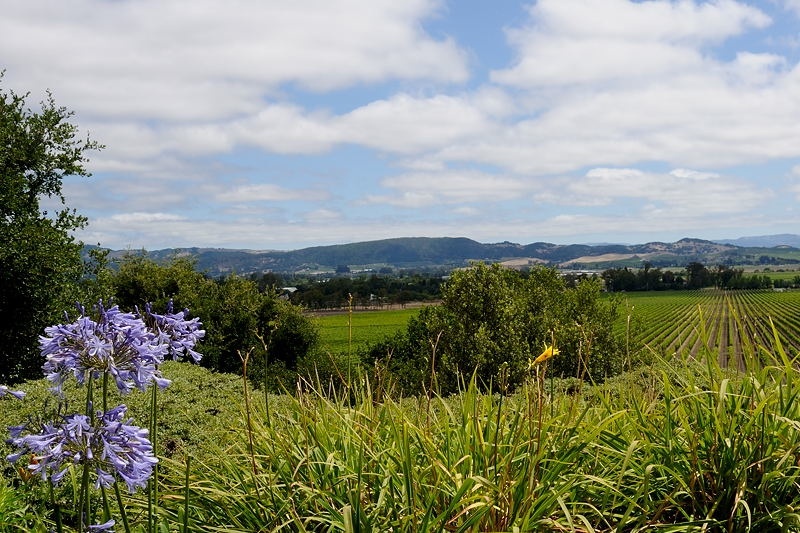 It was an easy drive from where we were staying to the wineries we had arranged to visit. Women winemakers are becoming more numerous in the Rioja area of Spain. In the 1980s, the Asociación de Enólogos de Rioja had 200 members, just 5 of whom were women. Today it has 308 members, and 106 are women. Not unlike the situation in California, relatively few women have become lead winemakers, despite their increased presence in the field. Nonetheless and also similar to California, these talented women are influencing the style and the quality of the wines produced. 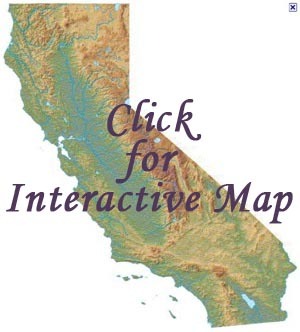 Similar cultural dynamics are at work in Spain as in California, where approximately 10% of wineries have a lead woman winemaker (California Women Winemakers). To quote Ana Martín Onzain, one of the winemakers with whom we talked during our visit, "There's no denying that the wine world, influenced basically by agriculture, is still stoutly masculine and would still find it difficult to accept a woman at the helm of a winery. But more and more trained women are graduating from Spain's schools of agronomy and enology; the time has come for greater responsibility to be handed over to them." Maite Fernández Mendoza, with whom we also met, agreed. She noted that, "In the past, it was important for women to be behind men. But things are changing. Today many women work in the fields and are involved in financial	decisions. Step by step, we see more women winemakers." An official listing of lead women winemakers in Rioja is not available, but we were able to identify several women winemakers through our research. 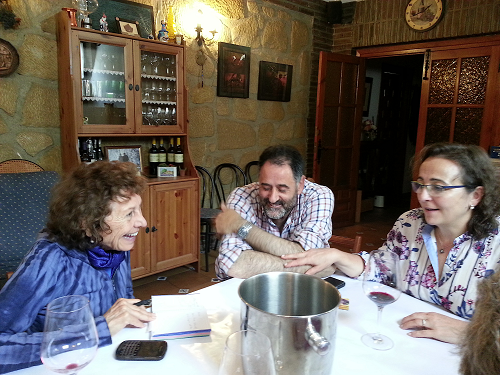 We were fortunate to be able to arrange times to meet with three leading women winemakers: Maite Fernández Mendoza of Bodegas Abel Mendoza, Marta Appellaniz Gallego of Bodegas y Viñedos Pujanza, and Ana Martín Onzain of Bodegas Castillo de Cuzurrita. Four others whom we identified but who were not available to meet with us during the time of our visit are Elena Adell San Pedro of Campo Viejo, Maria José López of López de Heredia, María Larrea of CVNE (Compañia Vincola del Norte de España), and Ana Blanco, formerly of Viñedos del Ternero. Maite Fernández Mendoza and her spouse Abel Mendoza of Bodegas Abel Mendoza just celebrated their 25th year together as a passionate winemaker and viticulturist team, who are considered among the region's modernists. Maite first studied in England, where she hoped to pursue public relations, but then needed to return to her village to assist her family. While there, she met Abel and was introduced to traditional and modern approaches to viticulture. Having his support from the very beginning, she came to share his vision and adamant focus on crafting age-worthy wines that would reflect the characteristics of different vineyards. 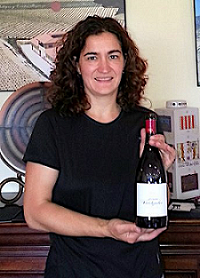 Maite studied enology in Logrono and "practiced what she studied in her own house." (For Maite, doing was always the best way to learn.) Maite and Abel do most of the work on their own on their estate in San Vicente de la Sonsierra, where they produce Burgundian style wines. It is a very small production winery of terroir-driven high-quality wines. In order to visit, you need to plan ahead. An appointment is required. Their winery is listed among the top wineries in Spain. Both Maite and Abel welcomed us warmly and we soon felt like family (see photo above). During our quite lively conversation we learned a great deal about their vineyard practices and their focus on quality. The winery produces high quality and terrior-infused reserve wines. These include Tempranillo and several unusual single varietals including Viura and Malvasía. The day of our visit we departed with several bottles of Abel Mendoza Selección Personal. 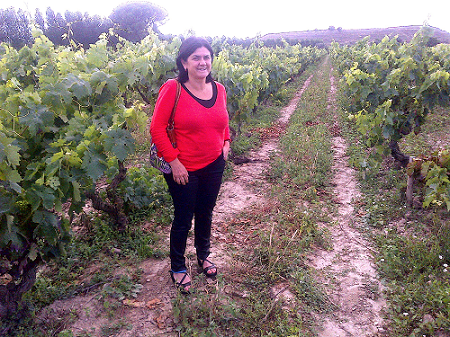 Marta Appellaniz Gallego produces wine at Bodegas y Vinedos Pujanza in the Rioja Alavesa area close to Laguardia. The daughter of Rioja grape growers, Marta studied food science at the Universidad del Pais Vasco before obtaining her masters degree in enology and viticulture at the Universidad Politécnica de Madrid, one of the premiere universities for the study of ecology and viticulture in Spain. In 2002, Marta joined Pujanza, a relatively new winery established in 1998 by Carlos San Pedro, its owner/winemaker. Interestingly, the year Marta joined the winemaking team was the same year of a very difficult vintage, but the wines produced by Pujanza in 2002 excelled nevertheless. Since that time, Marta has worked in various capacities at the winery and now holds the title of chief winemaker. She loves her work and feels fortunate to be working with such a dynamic team. The day we visited, Marta was involved in conversations about "branding" and seeking input about possible new labels. We were asked to provide our opinion on the various labels, and, of course, we were happy to do so! The winery produces two fine wines, Pujanza and Pujanza Norte, both Tempranillos aged in French oak. We were invited to taste both wines, and found them to be excellent! Ana Martín Onzain, who is among the most influential and highly regarded winemakers in Spain, became a winemaker "by chance." According to Ana, wine was not that important in Spain in the 1980s when she studied chemistry at the Universidad de Bilbao. After graduating, she needed work and successfully applied for a scholarship to study enology in Madrid. After completing her degree, "she had to work her way up," and was thankful for her enology education, strong character, and excellent palate. Ana is also appreciative of the fine mentoring she received. Ana returned to the Basque country in 1995, where she acquired fame for her Txakoli at Itsasmendi (Basque for "Sea and Mountain") de Bizkaia, a pioneering project in the Basque country. Txakoli de Bizkaia has received acclaim for its integration with nature, preservation of the terroir, quality winemaking, and fine white wines. In 1999, Ana moved to the Rioja area. New proprietors had purchased Castillo de Cuzcurrita in the village of Cuzcurrita de Río Tirón and undertook an extensive renovation of what was a medieval castle. The facilities are simply amazing and include several works of art by well-known artists. Ana was hired as the lead winemaker in charge of all aspects of winemaking, and has crafted award-winning Tempanillo wines. Although Castillo de Cuzcurrita produces Tempranillo wines only, Ana remains well known in the Basque country for her white wines. Ana, a person of great energy and creativity, also crafts wines in Cigales and in Bierzo, and for a new venture in Majorca called Can Axartell. For fun, she has a wine bar in Bilbao where she does wine tastings. We highly recommend your visiting Rioja to meet its impressive and engaging winemakers, to visit their wineries and to have the experience of enjoying their excellent wines. It is a visit you will long remember, and you will want to return! 1Note: Material for this article came from our conversations with the winemakers, the wine review blog, Women Winemakers of Rioja, posted at http://i-winereview.com/blog/index.php/2014/06/18/women-winemakers-of-rioja/, and the book, The finest wines of Rioja and Northwest Spain by J. Barguín et al. (2011), published by University of California Press.